On this date, 98 years ago, the Titanic sank. A tragic story as we all know. This post is not to make light of the loss ot life, but is meant in good fun. 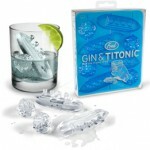 You have to love this… The “Gin and Titonic Ice Cube Tray” we found The Conran Shop. Seriously, this is so cool. What great fun for a themes cocktail party, or heck, ANY party! In fact, I am calling Sophie right now to have her put April 15 2012 on her calendar so we can have centennial Titanic gathering. Find this and all the cool things The Conran Shop offers here. Lost Cowboy is powered by	WordPress 5.0.4 and delivered to you in 0.875 seconds using 40 queries.